Kickstarter may have lost a little of its luster since the campaigns of Double Fine Adventure and the Ouya, but one of the most successful game crowdfunding campaigns to date resulted in Pillars of Eternity, a modern throwback to isometric computer RPGs. Created by Obsidian Entertainment, the goal was to create a game which hearkened back to crunchy, story-heavy role playing games of the late '90s, and by most accounts the studio succeeded admirably. 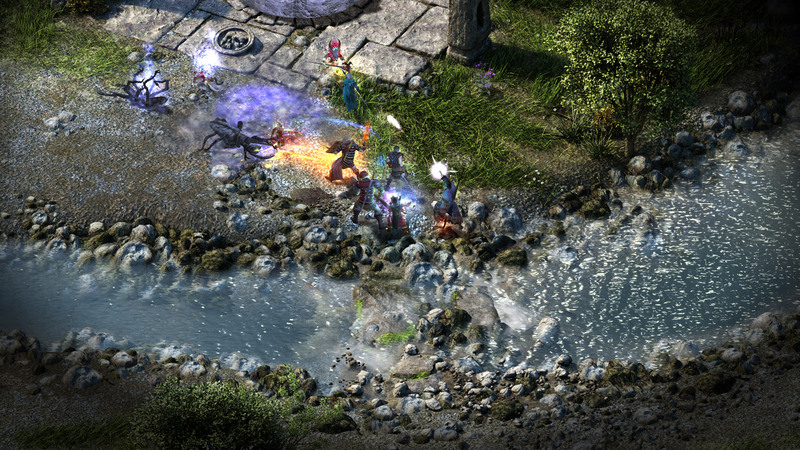 Pillars of Eternity became one of the most lauded western RPGs in recent memory, and the focus on providing multiple choices to players set it apart from most of its contemporaries. While Kickstarter backers and PC grognards have had access to Pillars since 2015, console players got their first crack at it recently when the title was ported to the Xbox One and PlayStation 4. So just how does the console version stack up? Pillars of Eternity's lore and gameplay are largely unchanged from the PC, and I'd highly recommend reading our review of that version for detailed information on story, graphics, and how the game plays. The console version adds both White March expansions to the base game, providing hours more story content as well as a pair of new recruitable companions. 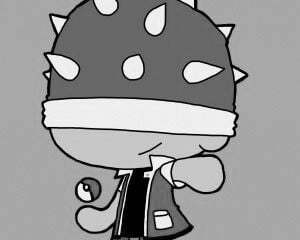 The level cap is raised to 16, and several new maps and enemy types are made available as well. Western RPGs from the era Pillars of Eternity is emulating focused on player agency, and whenever there was a choice between streamlining gameplay or giving freedom to the player, the latter option was usually given more weight. Obsidian has continued that tradition in its more recent games, and this sometimes causes glitches or other problems as unforeseen variables bump up against one another. Fortunately, having two years since the initial launch has allowed Obsidian to smooth out most of the problems that plagued the PC release, and I didn't notice any major issues during my time with Pillars on my PS4. That focus on player agency can be a little overwhelming at the beginning of the game. There are over 150 available combinations of character, class, and background at the outset, and you have the option to create an entire party of six characters if you don't feel like using the companion characters you'll meet on your journey. You control the statistic assignment for every character you create, so experimenting with a burly wizard or a dexterous cleric is up to you. This freedom can be refreshing if you're willing to put some time into it, though. It's hard to complain about a game where playing as a party of six bears is a viable option. 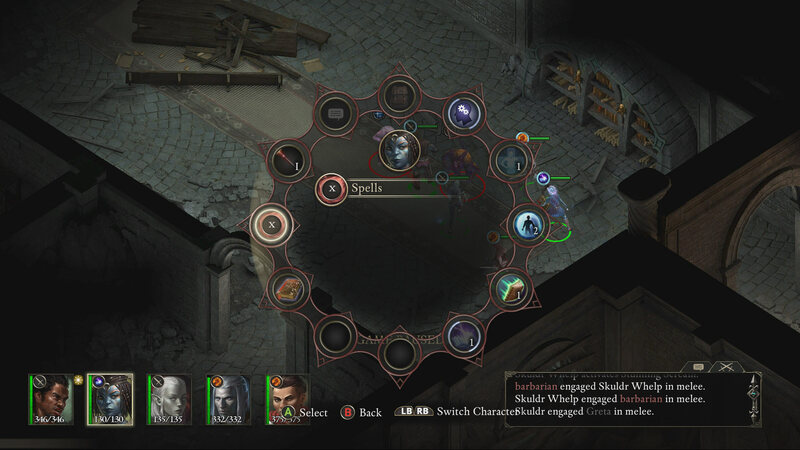 While a PS4 or Xbox controller can't readily approximate a mouse and keyboard, Obsidian did a great job mapping the complicated controls to a radial menu for the console versions. It's quick and relatively easy to access your inventory, level up characters, and use spells and abilities. There's still an awful lot to process, especially during combat, but the UI doesn't get in the way. There's a significant focus on text and dialogue, and as good as it is, players seeking action will probably be better served by heading back to Diablo III. This is a deliberate, methodical game in which you're often rewarded by unlocking additional lore about the world you're visiting. The lore is well written, and the story it describes is deep, mature and interesting. That being said, this is very much a game for a certain type of player, and it's unlikely to convert anyone who isn't already a fan of text-heavy fantasy adventures. I did notice there are some fairly significant load times whenever my party moved from place to place, including moving between locations on the world map or heading to an interior location from town. I was playing a fully digital copy installed to the hard drive, so I'm not sure what else could be done to mitigate this issue. It never got bad enough I stopped playing, but was definitely an annoyance during my time with the game.